Sussex Police, the government and Gatwick airport say that the severe travel disruption last year was caused by a "sustained" drone attack. The situation caused disruption for tens of thousands of passengers. 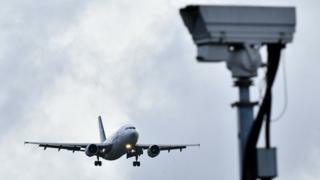 Gatwick's decision to close was taken after a risk assessment with police. The airport says there were well over 100 drone sightings over three days. The majority of those sightings were made by police officers or airport workers. Former army officer Richard Gill believes the Gatwick attack was "really well planned". His Nottinghamshire company, Drone Defence, sells systems used to detect drones, as well as other equipment which can jam the frequencies they need to operate. Because they were "very difficult to detect", the drones at Gatwick were, in his opinion, probably custom-built, rather than typical off-the-shelf machines. "If you've got a deliberate adversary who really knows about the technology and can apply it to cause harm, then it's very difficult to combat that." One government official described Gatwick as a "malicious attack". However Robert Garbett, of Drone Major Group, a company which advises airports on drone defence and security, is sceptical. For him, the closure of Gatwick for such a prolonged period of time was a "massive overreaction". "It's not really about drones, it's about the preparedness of airports in the UK, which in the past has really not been there," Mr Garbett said. He says airports are now "awake" to the issue, but his advice is that they should not rush out to buy new equipment. "They've got to take a risk-based approach." His opinion is that a standard-sized drone would probably cause minimal damage to a commercial airliner. "I would personally be more concerned about some of the smaller regional airports that are flying helicopters and lighter aircraft in, that are more likely to be damaged by the impact from a drone," he said. But as one aviation source put it, this industry has, naturally, to take a cautious approach. One key issue for some experts in the field is whether the drone sightings at Gatwick were in the flight path. A spokesperson at Gatwick said the drones "posed a threat to the runway". As for who was responsible, Sussex Police said the nature of the attack made it difficult for existing technology to track and identify the drones. The force described its criminal investigation as "challenging in its scale and in the type and quality of evidence immediately available". Questioned on why photographic evidence of the drones has not been released into the public domain to counter doubts about the validity of the sightings, Sussex police said video footage "has proved of insufficient quality, due to the time of day [and] distance" from those filming. Government and police sources have played down the idea of foreign state involvement. And no protest group has claimed responsibility. There is also no clear motive for organised crime. And if it was a sophisticated attack, with little evidence left for the police, it is logical to assume it was beyond the ability of a bored child. The "who did it?" remains unanswered.